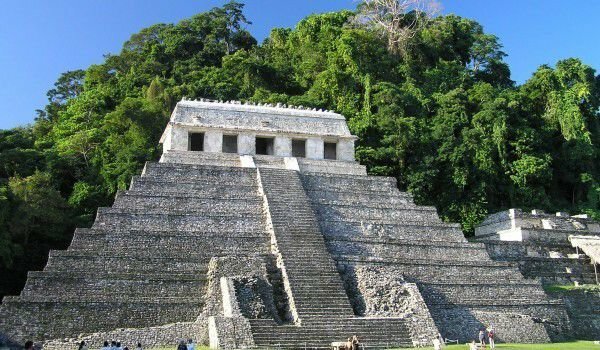 Palenque is one of the largest and most important archaeological complexes of the Maya. Palenque is located in dense tropical forests in the foothills of the Mexican mountain range in the state Tumbala Chiapas. The nearest airport is in the city of Villahermosa, the complex Palenque is located about 90 miles southwest of the village and about 130 km south of Ciudad del Carmen. There are many options to reach the ancient city, among which the cheapest is by bus. Palenque today is a popular tourist destination and around the Mayan village are built excellent tourist facilities with hotels and lodging establishments. The complex is one of the largest, most significant and important to the Mayan culture and need a whole day to be examined closely. Palenque is located in southern Mexico, near the river Usumacinta, at about 150 meters above sea level. In size Palenque is smaller than Tikal and Copán, but is one of the most impressive, and probably the most reserved. In 1981 it was declared a protected area and UNESCO included it in the List of World Heritage Sites in 1987. The mayan city was built on a high, strategically located plateau. Today, its elegant architecture, descriptive carvings, calligraphy and decorative friezes reach great heights and art works are almost perfectly preserved. Around 1746 the nephew of the Spanish priest Father Antonio de Soli was the first to find the white limestone buildings in Palenque. Other sources suggest that a traveler is the rightful finder- Ordonez and Ramon Aguilar, who traveled to the place of San Cristobal de las Kazas in 1773, intrigued by rumors of a town with stone houses. This inspired a further expedition in 1784 led by Captain Jose Antonio del Rio. But only in 1952, Mexican archaeologist Alberto Rus discovered a tomb hidden in the pyramid inscriptions. It belonged to Lord Pakaya, king-priest of the Mayan, somewhere around 750 Palenque extends over an area of about 3 square miles, but only 10% of the ancient city were discovered. It is assumed that in the jungles there are thousands of buildings that are part of Palenque . The name of the city was granted by the Spaniards, but the ancient name of the town remains a mystery. Palenque was the capital of the city-state or B'aakal B'aak. The ancient city of Palenque flourished in the seventh century and was one of the most important for the Maya then. The ruins we see today date from 100 BC, the abandonment of the settlement was around 800 AD. Much of the history of the settlement was read by the specialists of the stone inscriptions themselves, that the Maya left in Palenque. And because of that fact there is clear detail as to exactly what was the ruling dynasty in the 7th century and who were enemies of the village. The most famous ruler of Palenque was Pacal the Great, whose tomb was discovered during excavation work in the so-called ”Temple of the Inscriptions”. It is believed that was erected in the form of stepped pyramid tomb at the base in 675 years. That central to the complex of Palenque temple is 60 m wide, 42.5 m deep and reaches 27, 2 meters high. Inside were found reliefs describing 180 years of history of the city. The Cross temples group (Temples of the Cross) is composed of the Temple of the Cross, the Temple of the Sun, and the Temple of the Foliated Cross. Other famous and interesting buildings in the Palenque Temple of the Lion, are off about 200 meters south of the main group of temples, and aqueducts, the Temple of the Count, so named because of that early explorer of Palenque, Jean Frederic Waldeck, who claimed to be Earl, who lived in the temple for some time. In the complex of Palenque, visitors can see many buildings, pyramids, houses, apartments and more. More works of art are exposed in a small museum, recently opened at the entrance to the lands or in the National Anthropological Museum in Mexico City.